The HamiltonBuhl HACX-114 Personal CD / CD-R Player is built for extended use both, in and out of the classroom. 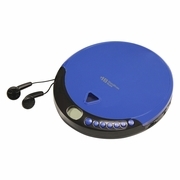 This CD player is a great, economical way to give individual audio and music lessons to students of all ages! This programmable CD player features a 60 second skip protection technology, low battery indicator and digital volume control. The HACX-114 comes with stereo ear buds and will provide the quality and portability you require in a CD Player.